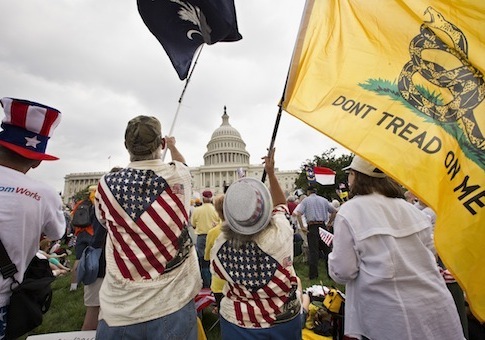 Congressional leaders, tea party activists, and Glenn Beck gathered in front of the U.S. Capitol to reiterate their concern over the Internal Revenue Service’s targeting of conservative groups, call for more investigations, and advocate for the abolishment of the agency on Wednesday. "My committee … has been trying to get answers from the IRS for more than two years. We’re just starting to get answers," said Rep. Dave Camp (R., Mich.), chairman of the House Ways and Means Committee. "I’m here today to commit to you we will get the answers. It will take time, but we will get the facts and we will follow them wherever they lead. We will get the truth, and we will hold those responsible accountable." Camp’s comments came at the "Audit the IRS" Rally. The event, which was organized by the Tea Party Patriots, was expected to be the Tea Party’s "largest demonstration" in more than two years. Camp joined a long list of speakers, including lawmakers from both the House and Senate, to address the crowd. Since it was revealed that the IRS had incongruously scrutinized the applications of conservative groups applying for tax-exempt status, Republicans and Democrats alike expressed outrage at the behavior. For their part, the Tea Partiers are still looking for accountability. Rep. Michele Bachmann (R., Minn.) told the Washington Free Beacon that while there has been "a potpourri of scandals … this one is unique, because with the IRS, it’s the power to tax; the power to destroy." "And now the IRS is going to have an impact on every aspect of our lives with this Obamacare," Bachmann added. "Everything changes. And so that’s why this is even more important right now, that every aspect be looked at, and we have to name names and people will probably have to go to jail. It’s just the way it is." Conservatives, including Bachmann, have expressed concern that the IRS will soon be responsible for implementing "more than 40" new or amended Obamacare provisions in the Internal Revenue Code. "Anyone want to fire some IRS agents?" Sen. Rand Paul (R., Ky.) asked the crowd. "Why don’t we start with the 16,000 IRS agents that are going to implement Obamacare?" asked Paul. "I’m like most Americans, horrified that my government has gotten out of control and is persecuting people for their religious and political beliefs and it needs to end and it needs to end now." Rep. Tom Price (R., Ga.) has proposed the "Keep the IRS Off Your Health Care Act of 2013" to "prohibit the Internal Revenue Service from implementing or enforcing any provisions of the president’s health care law." The bill was referred to committee May 16. Bachmann said she hoped the bill would come out of committee soon, but added "I would like to see much more of an aggressive pace from our side, but I think that there is a desire to address it." Transcripts of interviews conducted by the House Oversight and Government Reform Committee were released to the press this week. According to a report by the Associated Press, Holly Paz gave statements contradicting "initial claims by the agency that a small group of agents working in an office in Cincinnati were solely responsible for mishandling the applications." This entry was posted in Politics and tagged Dave Camp, IRS, Michele Bachmann, Obama Administration, Rand Paul, Tea Party, Tom Price. Bookmark the permalink.